It doesn't seem that long ago that what was the Jordan team, under the guises of the likes of Midland and Spyker, were fodder somewhere off the back of the pack. It's fair to say that when Vijay Mallya, four and a half years ago, purchased the outfit and renamed them Force India few expected that state of affairs to change much. But change it has: the transformation of the team in the time since has been remarkable. A restructure and technical tie-up with McLaren later and Force India have made tangible progress year-on year with each season's constructors championship finish higher than the one before (as Force India their finishes have been, in order: 10th, 9th, 7th and 6th). And they finished 2011 as firmly the best of the rest behind the 'big four teams', even sneaking ahead of the Mercedes pair on occasion, including in Adrian Sutil's stellar run to sixth place in the final round in Brazil. Given an extra round or two they could well have sneaked ahead of Renault in the constructors' table as well. In achieving this Force India have usurped many outfits with greater budget and resources than they (apparently designer James Key, after leaving Force India for Sauber, was astonished at the simulation tools Sauber had in comparison to those of his previous team). And through it all they give the impression of being a proper little racing team, with a healthy commitment to giving young, talented drivers their chance and not viewing drivers in terms of the budget they bring. They start out 2012 with a driving line up, in Paul di Resta and Nico Hulkenberg, that almost any team in the pit lane would be content with. And on the evidence of the launch and testing, they also start the year with a fine car. At the start of 2011 the team had recently lost a lot of technical staff and in the opening races were for the most part only the ninth quickest team out there, behind the likes of Sauber, Toro Rosso and Williams. It took Force India a while to really start to exploit the exhaust blown diffuser, but after an upgrade in this area, eventually raced at Silverstone, featuring a complete redesign of the car's rear, they never looked back. A Force India scored points in every round of the second half of last season aside from in Japan, and in three rounds both cars scored points. And on the available evidence thus far Force India are well placed to consolidate at least in 2012. The car turned many heads at its launch, looking to be, along with the Ferrari and Mercedes, the most radical departure from its predecessor. The sidepods are heavily undercut to allow more airflow to the diffuser and there is plenty of detail on the front wing. And, overall, observers have commented in how the whole machine looks like it hangs together effectively. As Gary Anderson said: 'This car really does look like all those bits are connected up and will all work together as one efficient unit. It's what every aerodynamicist and design engineer dreams about'. And it's backed all of this up by going well out on track seemingly, looking to have a strong aerodynamic base, handling well, responding well to set up changes as well as running reliably (despite a driveline problem on one of the Barcelona days). It's hard to say where exactly it is in the pecking order: the midfield looks to be tightly-packed and midfield runners tend to vary their fuel loads more in testing than do the front runners, but the signs look good for Force India. Some are even suggesting that they may give the 'big four' teams something to think about on occasion this year. But to some extent Force India may be a victim of their own success, as there is a real risk that for a team of their resources (around 280 staff) they're somewhere close to their glass ceiling. Progressing from here will probably require expansion and therefore will require money. Which brings us to a big potential problem for Force India this year: Vijay Mallya's business empire is in a lot of debt, with Kingfisher Airlines thought to be in particular trouble. Will this impact on the money available for Force India? Sahara now hold a 42.5% stake in the team, but it's not yet clear exactly what their ambitions are for Force India and how much cold, hard cash they would be prepared to offer to help them build on where they are. But in the here and now at least, things are looking good for Force India. 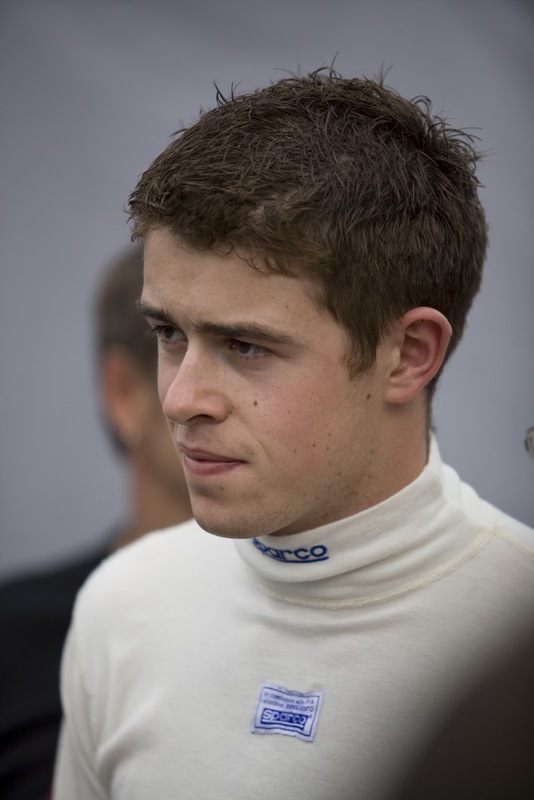 Paul di Resta was a revelation in 2011. The fact that he hadn't raced a single seater in five years, was coming in from DTM, not the classic route, and that we live in an age of testing restrictions, led many to believe that it would be a difficult transition to F1 for him and, at least, some sort of settling-in period would be required in his debut season. 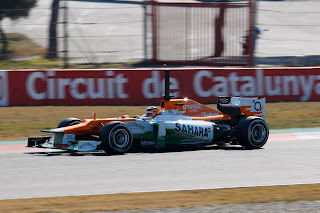 Yet di Resta was right on it from the off in 2011, and impressed just about everyone throughout the year. He showed an assurance, calmness and class in and out of the car of someone with several years in F1 to call on. His minimalist and smooth driving style drew immediate comparisons with Jenson Button. And most importantly di Resta showed in 2011 that he also can do the business out on track - delivering both lap times and points. Last year he took eight points finishes and, amazingly, completed more racing laps in 2011 than anyone else on the grid. Astonishing for a rookie in a midfield car. His high tide watermarks included qualifying sixth at Silverstone, as well as finishing seventh in Hungary and sixth in Singapore, in each case enacting long strategies perfectly. And in the first half of the season he showed his quick and more experienced team mate Adrian Sutil the way to go, firmly outqualifying and outscoring him in this period. For a number of reasons Sutil got the upper hand by the time the year was out, but di Resta did enough throughout the year's entirety to show, despite going through a phase of losing a few too many front wings, that he may well have a real x-factor about him. But di Resta can't afford any let up in 2012. He'll have a tough yardstick at the team in the rapid Nico Hulkenberg, in the second season in F1 the expectation levels go up a notch or two and the leeway for not delivering goes down in turn, and if he doesn't impress, for whatever reason, opportunities to move to a big team for 2013, such as at Mercedes, may pass him by. However on the evidence of 2011 di Resta will continue to do himself justice in 2012. 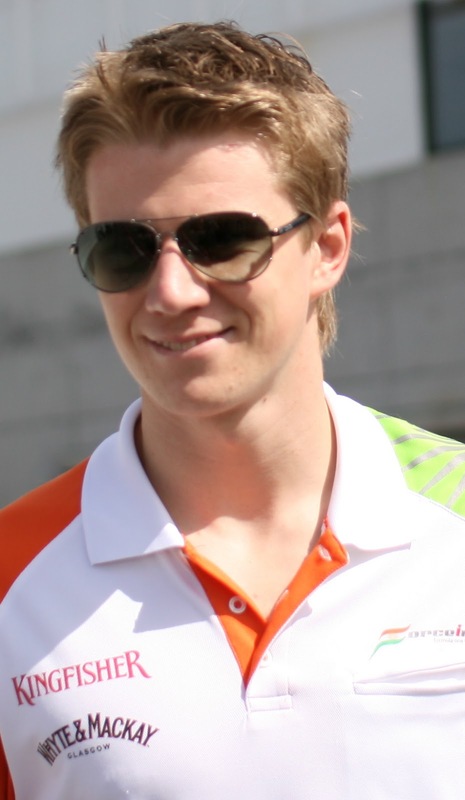 This year will be witness to the welcome return to the F1 grid of Nico Hulkenberg. Hulkenberg entered F1 in the Williams team in 2010 with a big reputation, embodied by his 'new Schumacher' tag and an enviable record in the lower formulae, such as in A1GP, the F3 Euro Series and GP2. It didn't happen immediately for Hulkenberg in F1 though, as without extensive testing he rarely threatened team mate Rubens Barrichello on pace initially and also was rather crash-happy. In the latter part of the year he got things right though and, despite the odd instance of egregious weaving in defence of his position, began to look like he belonged in the sport. (As an aside, apparently Hulkenberg only matched the number of miles in an F1 car that Lewis Hamilton had before he took part in his debut race, in Hungary 2010, and it was in Hungary that Hulkenberg began to impress). This all culminated in a famous pole position claimed on a drying track in Brazil, Hulkenberg beating all of the big-hitters in better cars as he did so. Admittedly, the Hulk could throw caution to the wind, in a way those battling for the title at the time couldn't, but it was still a mighty impressive effort. However almost immediately, in a decision that owed more to balancing the books than driving merit, he was shown the door by Williams at the end of the year. 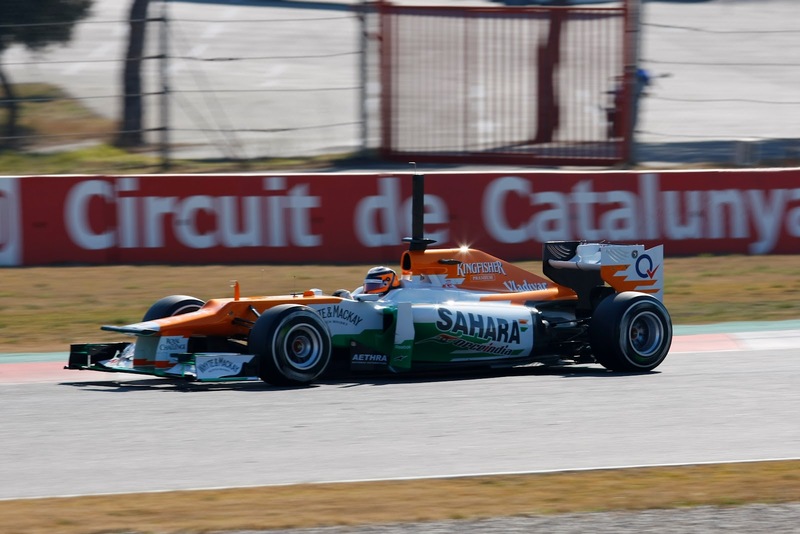 With few 2011 seats available, he joined Force India initially as a tester in 2011 but with a 2012 race seat promised. And now that particular egg has hatched. This year is a magnificent opportunity for Hulkenberg to begin to make good on his promise shown on the way up, and with experience of F1 and a whole year of running in Force Indias in Friday practice, to string together a whole season of good performances. He's looked to be driving well, and quickly, in testing. No one's betting much on which way the di Resta-Hulkenberg match-up will fall in 2012.